These always go quickly in my house. Slice the eggplant into long pieces (like rods) that are about 1/2 inch thick. Beat the eggs and pour onto a plate. Mix breading with spices and put on a separate plate. 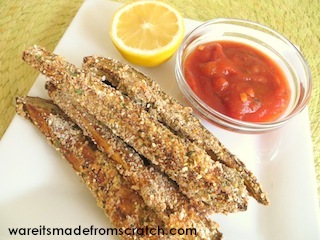 Dip each piece of eggplant in egg and then in the breading. Lay each piece on a cooking sheet. Drizzle — or spritz — a small amount of olive oil over each piece of breaded eggplant. Serve with lemon to squeeze over and tomato sauce to dip in. Find out here how to make your own sauce from scratch.